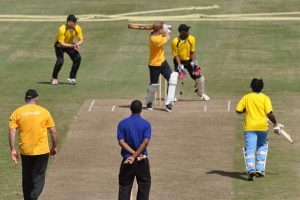 Sammy Stadium yesterday morning to Captain a Prince Harry’s X1 against a Prime Minister’s X1 led by St Lucian PM Allen Chastanet. The visit to St Lucia, often referred to Helen of West Indies because the Island often switched between French and British rule, was a part of the Prince’ tour of the Caribbean which includes a visit to the South American nation of Guyana. 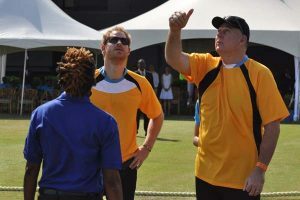 The six-over a-side game began in the scorching heat at 09:30hrs yesterday and was won by Prince Harry’s X1 with the Skipper clobbering 18 from six balls bowled by Prime Minister Chastanet and a stand full of students from schools in the area and specially invited Guests, roared its approval. Prince Harry is the younger son of The Prince of Wales and Diana, Princess of Wales. Prince Harry lives at Kensington Palace in London. His Royal Highness carries out public duties in support of The Queen alongside a number of charitable activities and projects. surprise that the fit 32-year-old Prince looked the part of a cricketer when he batted and some useful off-spin with an action that was as clean as whistle. However, the Prime Minister, who represented St Lucia at Basketball, was stumped of his Royal Highness’ bowling looked at sea with the bat. A large media crew of English Journalists and photographers is following Prince Harry on his Caribbean trip.